This Introduction to Statistics Course uses problem­-based learning that shows you how to apply your knowledge in real­-world situations. Our Many Ways™learning model feature multiple teachers and various instructional styles for each concept so you can find a style that meshes with your individual learning preference. This rich, immersive experience helps you better understand and retain information, for an all­-around smarter way to learn. SOPHIA's Introduction to Statistics Course helps you gain mastery of the basic principles of statistics. In this Course, you will learn a variety of topics,including statistical principles, research methodologies, data analysis, and hypothesis testing. 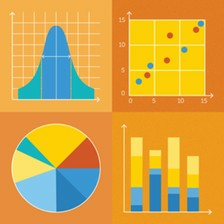 You will also have the opportunity to demonstrate the application of these topics in statistics to everyday situations. This course was very straight forward. I was surprised at how much I learned. The videos were so much more helpful than trying to learn the material by reading it on my own. The amount of practice questions were sufficient to ensure I understood each topic.